The American stand-up comedian Doug Stanhope once said that you “should laugh everywhere you can find even the slightest glimmer of humour.” It’s an optimistic outlook on comedy. That I laughed during Jason Moore’s new comedy film, Sisters, more than probably any other American comedy this year possibly says more about the state of American comedy cinema than any real merit of Moore’s film. That’s a pessimistic outlook on comedy. I wonder if, when Doug Stanhope encouraged our laughter in that way that I mentioned above, he had the homophobic breed of humour that has been hovering over too many American comedies for far too long. This isn’t the first review of mine this year to wonder at the fact that homosexuality is still a punchline in Hollywood. It’s not the second either, or even the third. There’s a sense during Sisters that Moore isn’t in tune with the fact that he’s being homophobic because the film takes cheap shots at female homosexuality rather than male homosexuality. It’s a small part of the film but already one paragraph of this review. That might say something about me or something about the arrested development of Hollywood’s mentality. Probably both. Granted, “Hollywood” is an extraordinarily broad way of describing the American film industry but it feels a bit rich to pat yourself on the back for making Brokeback Mountain with one hand while sniggering at lesbian stereotypes with the other. It may be pessimism, but I can’t laugh at that sort of glimmer of humour. The sheer counter-productivity of it is one thing. The staleness of the humour is another. But there’s about as much to like about Sisters as there is to dislike. 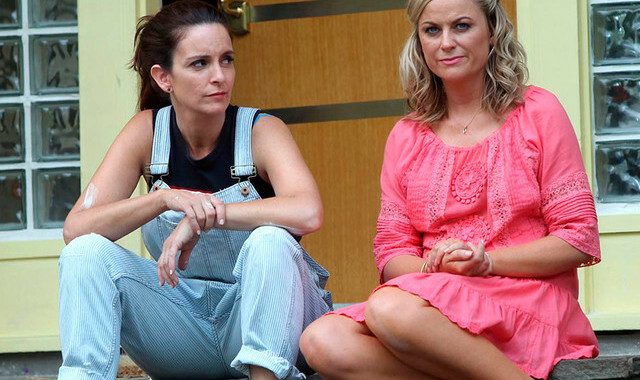 Maura (Amy Poehler) and Kate (Tina Fey) are siblings. Maura is recently divorced, a nurse, and worries too much. Kate is a single mother, was recently fired from her job as a beautician and she’s homeless. They head home after they discover that their parents are planning on selling the house that they grew up in. Charged with the mission of cleaning out their belongings, they instead decide to throw a party and invite all their old high school friends. The plot is chaotic and unfocused, which doesn’t matter so much in comedy if there are enough laughs to keep the mind diverted. There are a handful of funny moments in Sisters, and a couple of very funny moments. Out of pity, Maura invites Alex (Bobby Moynihan) to the party. He’s the guy from high school who channelled his loneliness into extreme pop culture enthusiasm. Alex unwittingly takes drugs and from then on almost every time he’s on screen, Sisters is funny. Drugs as comedy has become particularly prominent over the past few years, largely thanks to Seth Rogan, and yet Moynihan’s performance is enthusiastic and astute enought to distinguish itself from the other recent drug-fuelled comedic performances. Moore’s film also benefits from the charm of the two leads. Both women, particularly Poehler have natural comic instinct and have an ability to imbue the same tired beats that have been plaguing Rogan and his male contemporaries with a sense of energy and fun. But that same laziness that has begun to creep into Rogan’s films (Rogan here representing a wide number of American film comedians, for the sake of brevity) also afflicts Moore’s. We’ve seen most of the jokes that Sisters has to offer, and the plot has nothing to offer. Both issues contradict the talent in front of and behind the screen. Comedy is infamously more difficult than drama but apathy doesn’t help. Sisters is an entertaining movie, which is more than I can say for most films of this ilk that have been release this past year. But when it could have been something worthwhile, and it could have been, then why isn’t it?